We are an independently owned and operated, 120 acre tree nursery that has been in operation since 1950. We are located in Stephenville, Texas, about 60 miles southwest of Fort Worth, Texas. Miller Nursery & Tree Company specializes in B&B (Ball & Burlap) trees and container trees for wholesale trade customers. 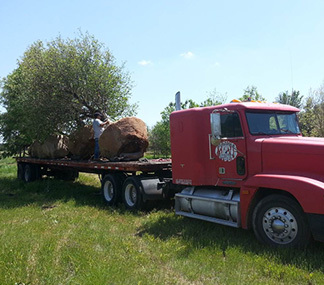 We have a huge selection of Texas native trees and also shrubs, vines and ground covers that thrive in Texas climates. We own and grow our own inventory. We have our own fleet of trucks and will deliver anywhere in the United States. We also provide a tree planting service with heavy equipment for the larger trees. While our regular terms are cash, we will be pleased to make credit arrangements with established concerns. Open accounts are payable 30 days from date of invoice. No cash discounts will be allowed as it is our policy to maintain attractive wholesale prices consistent with high quality stock.